In Aztec mythology, Mictlantecuhtli is lord of Mictlan. 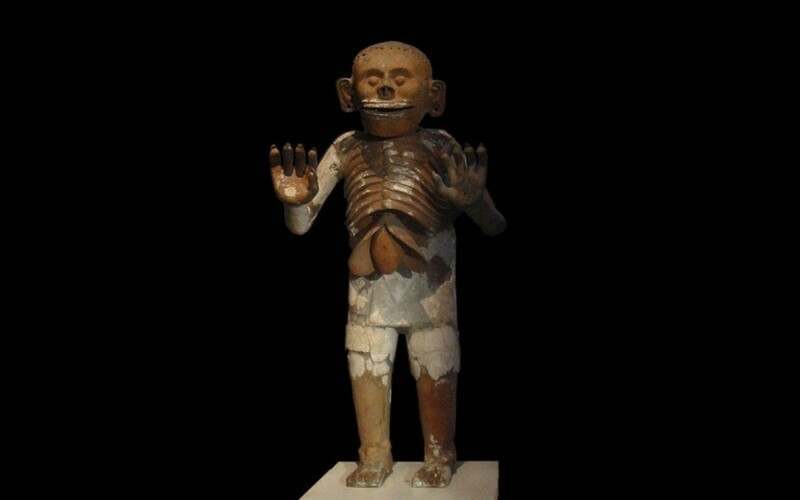 Mictlan is the lowest section of the underworld, where most souls are transported to after death – sacrificial victims would go to a different section. Those who died drowning didn’t even go to the underworld, but to a paradise world. There are nine levels of Mictlan where souls would be put to dangerous tests like crossing rivers full of deadly Jaguars. Mictlantecuhtli was the most powerful and important of all the gods of death. With this in mind, the Aztecs worshipped him with absolute devotion, sometimes even engaging in cannibalistic tributes to him. He is usually depicted as a skeletal figure with bulging eyes and sharp claw-like fingernails. He wore a necklace made from human eyeballs and earrings made from human bones. Him being skeletal was symbolic of his connection to both our world and the underworld. According to Aztec legend, the god Quetzalcoatl entered the underworld to collect bones – but Mictlantecuhtli refused to give him the bones. So Quetzalcoatl simply stole the bones. 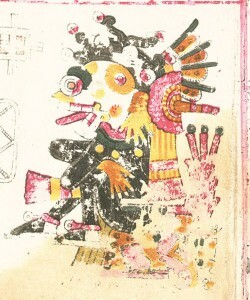 But Mictlantecuhtli chased him down and forced him to drop the bones back into Mictlan. On landing back in Mictlan they shattered on the ground. Quetzalcoatl later returned to collect the broken bones and transported them to our world where he transformed them into humans and animals. The broken bones explain why animal species vary so differently. Mictlantecuhtli and his wife live in a small house in Mictlan with no windows. His wife was Mictecacihuatl. Her responsibility was to protect the bones of the dead as moving peoples bones could alter their fate. She was said to have been born a human. But was sacrificed at a young age. How she ended up as his wife is unknown.